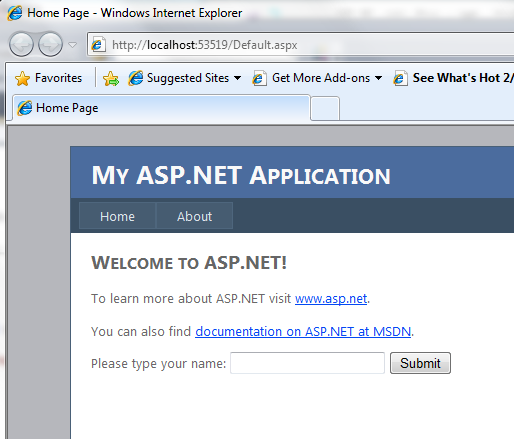 ASP.NET AJAX is Microsoft’s implementation of AJAX that integrates with ASP.NET. All we need to do to enable AJAX in a web page is add a ScriptManager control. The same would happen if we add a ScriptManager to a page and we add another one to a user control. To resolve this, we need to use the ScriptManagerProxy control. The ScriptManagerProxy control allows a page or a user control to find the ScriptManager control defined inside the parent page. It’s a good idea to add a ScriptManager control to our Master page and use a ScriptManagerProxy control in every page and user control in our web application that needs to use AJAX. So let’s try it out. Open Microsoft Visual Studio or Microsoft Visual Web Developer Express and create a new ASP.NET Web Application in your favorite language. I used C# and named the project WebExample. Open the Site.Master file and add a ScriptManager inside the form tag. Now open the Default.aspx file and add a ScriptManagerProxy inside the second Content tag. And add the following before the Content closing tag. Finally, open the code behind (Default.aspx.cs) and add the following function inside the class. We’re using the UpdatePanel control to be able to update an area of the page using AJAX. Everything inside <ContentTemplate> can be updated by our code without affecting the rest of the page. When the user clicks on the button, the code behind will be executed as normal, but only the 3 controls inside the UpdatePanel will refresh. Type your name and click on Submit. 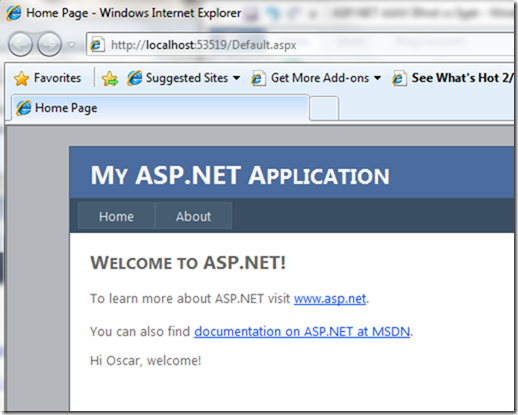 The page will update without “flashing” as it normally occurs with a post back in ASP.NET. That’s AJAX in action.